(Disclaimer: I am a soft southerner; I giggled at the above; This was my first game of rugby league - save for one in Australia at the Sydney Football Ground, which I attended because it was the only place in town that was open and serving beer - and I don't know the rules). I was one of tens of millions that tuned into Grandstand in my youth. Rugby League was all over Grandstand like a cheap suit, and yet I can only remember one man and his infectious voice: 'talking trilby', Eddie Waring. Eddie is my go-to man to get out of any conversations about Rugby. He divided opinion apparently, but I loved him. Giants; Warriors; Wildcats; Dragons....these chaps all belong in American or Australian sports don't they? Those names don't sit well with me in English sport, but having said that - here was a game that pitched The Tigers v The Rhinos at a place formerly known as The Jungle. The new Battle of Krugar? I enjoyed that. Whatever, it certainly ranked higher than the alternative which was a spot on the sofa watching the Royal Wedding - even though it was a five hour drive away. Being a simpleton and new to this sport, I seeked advice on Twitter before heading north. "Make sure you shout 'good yards' at regular intervals," said Mr Boyes. Not a problem. "They have a bin where you can place your affronts against the Lord." added Mr Whittall. I've plenty of those to confess I thought as I pulled up a chair. "A time keeper sounds a hooter instead of a whistle," Wow, I love my hooters. "It's 13-a-side. No Scrummage, five tackles and then change possession," claimed Mr Booth. That's a nice touch, they give the two subs a go from the start. Boom. So, Castleford v Leeds it was. A genuine rivalry. If I was going to break my RLD (Rugby League Duck) there was no point fannying around with Harlequins was there? Let's head straight to the heartbeat of the sport and drink it all in. 'Wheldon Road is decrepit, but provides one of the best and most volatile atmospheres in the game' trumpeted my guide book. Woof. Where do we sign? I was excited. Friendly stewards in comedy outfits, tick. Old habits die hard, and so our pre-match routine consisted of beer. And football. Beer at the excellent Henry Boons pub opposite Wakefield Westgate station - four pints weighing in at under £10 raised a eyebrow from the Southern contingent - and football in the shape of the last ever game at Wakefield's College Grove, ahem. stadium. We'd be all be about Rhinos and Tigers at the rugby later, but for now the chat centred around cows, gravy and dogs. Cow tipping is big in these parts according to, cough, an unnamed source. It's an act of pushing over a cow whilst it's stood (stood) there asleep. If you think that's bonkers then get a load of this: some pubs in Yorkshire have guest gravies with their roast dinners. I love my guest ales on draught, but guest gravies anyone? To top it all off there was two dogs in the football ground. The icing on the cake didn't happen though; said canines weren't seen running off into the distance having stolen a string of sausages from a local butchers shop. There's always next time. Today was all about rugby though. (there's a sentence I thought I'd never read on these pages - Ed.). Within seconds of the referee blowing the final whistle in Wakefield, we were off and into a cauldron of noise down the road at Castleford in time for the starting hooter siren. There was our first twist. No hooters in Cas lad. And Waring was right. It was one ton of rugby - meat, muscle, brawn, brain, the lot of it. At the start it was loud, very loud. But the biggest cheers weren't reserved for points on the board; rather for bone crunching tackles. I winced. The locals around me bellowed their seal of approval and punched the air with delight. Then came controversy. Lots of it. Cas had two tries disallowed for marginal forward passes early on. But did the players surround the referee, tug his shirt and point their fingers into his chest? Did they 'eck as like. They accepted his decision(s), the game moved on, and at quite a pace. Yes, players went down injured from time to time, but rather than stop the game, the physios ran onto the pitch during play and attended to seemingly broken limbs whilst the match was still in progress. This I liked very much. I celebrated with a beer. Leeds played in pink. I'd never thought I'd see a Leeds side trotting out in pink in any sport. I wasn't about to argue with them. They visitors were rampant. Their defence stood tall and their [insert names of other positions that I'm yet to learn just yet] players were all on song. The return of Rhinos' star names Peacock and McGuire boosted the ranks, with the former especially impressive. Carl Ablett was another who caught my untrained eye, and the whole thing was bound together by the boot of Kevin Sinfield. It was tough on Cas who didn't have the rub of the green early on, and they looked weary after that. Three games in just seven days clearly hadn't been kind to them. This is a tough sport. There was a slight edge to this derby in the stands, but nothing sinister. To me this was just how a local derby should be; passion, songs, banter, flowing barrels of beer and yet absolutely no threat of violence on the terraces. I can't actually recall seeing a single police officer on duty and there must have been a good three thousand away fans in a crowd of 9,860. That figure isn't too bad when you consider Cas has a population of around 40,000. So will I engage in any more Super League? Yup. Plans were already being hatched as we headed back south with the sound of "Marching on Together" ringing in our ears. Am I hooked already? We'll see. I entered The Jungle with a cynical hat on. I exited it with a spring in my step. No all night drinking session this time. I was home in time for an early bath. You can follow European Football Weekends on Twitter. When we booked our Easter family holiday last year, we settled for a trip to Japan. However, due to those circumstances, we were forced to cancel that one at short notice and rebook another trip. The choice went to Italy, not quite the same as Japan, but on the plus side was the opportunity to catch some local football, which eased the disappointment somewhat. First stop was Rome, home of Lazio and AS Roma. Both teams are deadly rivals of course but walking in the streets of Rome, you would hardly notice the presence of two big teams in the city. In most of the touristy areas, Roma shirts and souvenirs are on sale, and very rarely Lazio stuff. 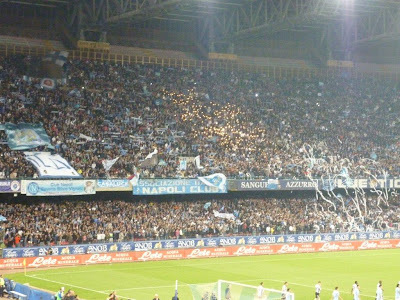 It is said that the Romanisti are from the capital city, while the Laziali are mostly coming from the Lazio region and the towns around Rome. As an outsider, I won’t take this for granted and leave that to people better placed than me. 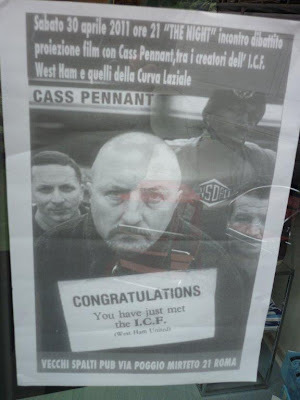 There are of course Lazio shops around the city, like the one very close to our hotel in Ottaviano, where the West Ham-Di Canio-Lazio connections were…erm quite obvious. And SS Lazio are also the oldest team of the city, as they were founded in 1900, while AS Roma are the result of the merger in 1927 of three local teams, a move destined to rival the stronger Northern Italy clubs. 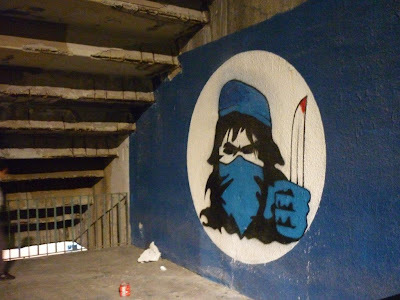 Lazio, on their side, refused to take part in this. We stayed in Rome for five days and luck was on my side, as the Giallorossi of AS Roma were due to play Palermo at home on the Saturday at 6pm (very handy timing), which was the last day of our stay there. Roma are having a troubled season and the Stadio Olimpico was never going to be full. I nevertheless purchased my ticket a couple of days beforehand, in the club shop located in the posh area of Piazza Colonna, for the hefty sum of 15 euro (these were the cheapest ticket though, some were as high as 100 euro). As I had done a little bit of homework (but not enough, more of that latter), I had noticed that between the Flaminio metro station and the Stadio Olimpico, located in the north of Rome, there was another football(and occasionally rugby) stadium, the Stadio Flaminio, home of the Italy Rugby team but also of Atletico Roma. Furthermore, this stadium was built in 1957 on the site of the stadium which hosted the 1934 World Cup final, the Stadio Nazionale PNF, destroyed in 1953, so a little bit of an historic place. until last season, they were promoted to Serie C1 (officially called Lega Pro Prima Divisione nowadays), when they also changed their name to Atletico Roma FC and their colours red and white to blue and white. I had actually heard about Cisco Roma a few years ago, as they were the last club to have the infamous Paolo Di Canio on their books, for the 2006-2007 season. Looking forward to take a look at the stadium and maybe sneak in to take a few pictures, I was pleasantly surprised when I discovered that there was actually a game taking place there (there is a God - Ed.) so much for my homework then, as Atletico were taking on Gela, a team from the South coast of Sicily (maybe they travelled together with Palermo to the capital, hence the Saturday afternoon kick-off). After much discussion with the stewards outside the stadium, they finally allowed me in for the last half-hour. The stadium, which can host 32,000 people, was virtually empty, as they were only about 1,000 people watching this Serie C1 fixture. Gela won the game 2-1, boosting their survival hopes, while Atletico are, somewhat surprisingly, still fighting for promotion to Serie B through the play-offs. 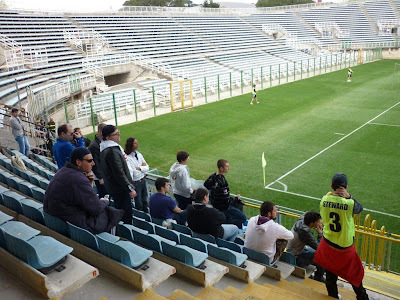 If they do get promoted though, I wonder what kind of crowds they would get in Italy’s second tier (although they certainly would not be alone with a small support, Serie B crowds are often poor, a club like AlbinoLeffe for example are regularly playing in front of only 500 only). After that unexpected bit of action, it was time to move on to the Stadio Olimpico across the Tiber river, a 15 minutes walk from the Flaminio. The stadium was built in 1930 and called Stadio dei Cipressi, and was part of the larger sport complex known back then as Foro Mussolini. In 1960, it was renamed Stadio Olimpico for the Olympics. Somewhat surprisingly, the Mussolini years legacy is still present, like this modern obelisk in front of the stadium. 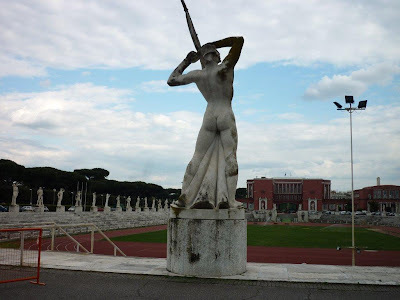 Next to the Olimpico is the Stadio dei Marmi (stadium of the marbles) built in 1920, also part of the Foro Mussolini (now Foro Italico), a quite visually stunning place, made of 59 marble statues representing athletes from the Italian provinces. Today, the Olimpico, once more rebuilt for the 1990 World Cup finals, can host 72,000 people. Only about 33,000 came for this AS Roma v US Città di Palermo Serie A game. As I said earlier, Roma are having a bad season by their standards. Claudio Ranieri was sacked in February of this year and replaced by former local favourite Vincenzo Montella, but results have not really improved, the team being in 6th place. 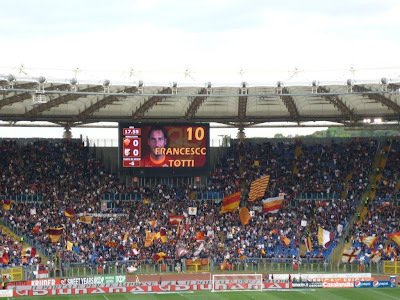 Before the game though, the local fans gave their players a good reception, especially to their God, Francesco Totti, who can seemingly do nothing wrong in their eyes. The day before this game, Roma became the first Italian club to have foreign ownership, when a consortium led by Thomas Di Benedetto (obviously from Italian origins) bought 67% of the club shares. Many American flags were waved by Roma fans, but the Curva Sud were not impressed. For their part, Palermo have nothing left to play for in the league, concentrating on their run in the Coppa Italia (they are in the semi-finals), and it showed on the pitch, as they largely tried to prevent Roma from playing and rarely tried to attack. Coach Delio Rossi was back on the bench for the visitors, less than two months after he got the sack from crazy Palermo owner, Maurizio Zamparini. Midway through the first half, Roma were awarded a penalty, duly scored by who else than Totti. Everything was set for an easy win for the locals, but it was not to be. Just before half-time, in one of their rare excursions in Roma’s box, Palermo were also awarded a penalty, converted by Chilean Mauricio Pinilla. booing and whistling. It finished 3-2 to Palermo, sending their 200 followers wild and more barracking from the AS Roma fans. Roma are still Rome’s second team as Lazio are 4th and in the Champions League places. 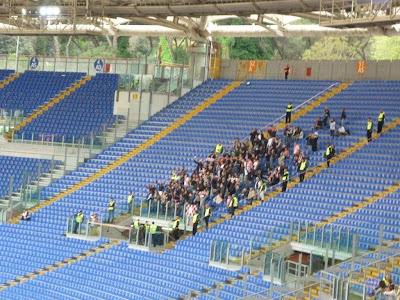 The Palermo fans enjoy their trip to the continent. It was 8pm, time to go back to central Rome and another great Italian meal with my wife and my kid! 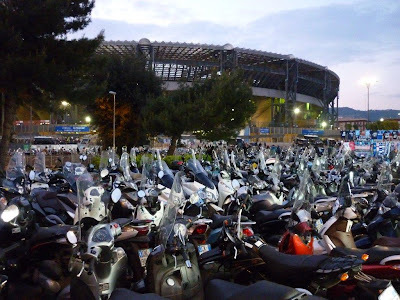 The next day, we took the train from Roma’s Termini station south to Naples, the city of Maradona, uncollected rubbish, the Camora, the Vesuvio and of course, SSC Napoli. When exiting the modern Napoli Centrale train station, you get the city in the face. Uncollected rubbish lies everywhere, most of the buildings are covered by tags and graffiti and the whole place looks run down. The next day, I hired a car there for the rest of our trip, and it was the scariest city drive I have ever had, and I have driven before in places such as Athens and Palermo. 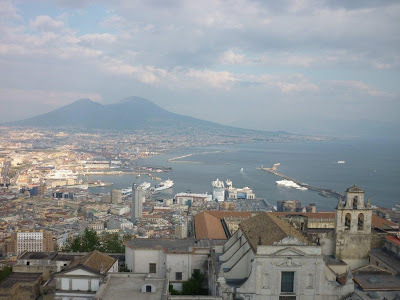 The setting of the city is stunning though, with the Vesuvio looming above the city and the Gulf of Naples. But on to the football, as the local team were hosting Udinese in the Sunday night game. Thanks to EFW member Paul Whitaker’s advice (thanks mate), I had purchased my ticket through the internet, as I was unsure to get a ticket on the day of the game. It turned out to be a good move, as the game was a 60,000 sell-out. 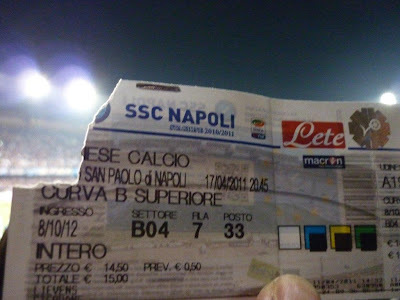 The nominal price was the same as in Rome (15 euro), but I had to pay more than that, but hey, like Paul said, it is not every day that you get the chance to watch Napoli in a full San Paolo. And the ticket was waiting for me at our hotel in Rome. Taking the metro to Stadio San Paolo in the Fuorigrotta district West of the city (if you ever take the metro in Naples, don’t bother buying a ticket as all the turnstiles seem to be broken), there seemed to be surprisingly few Napoli fans on the train and also around the stadium about one hour before kick-off. As I found out later, the reason was simple : most of the fans were already inside the stadium. 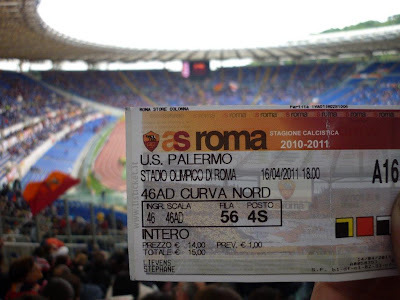 In theory, I had a seat in the Curva B, but when I got inside, I soon realized that it would be impossible to get near the place were I was supposed to be seating (while in Rome the day before, it was a lot quieter, even in the Curva where I was sitting). I had to settle for a standing place at one of the Curva’s entrances, and lucky I'm a tall bloke, otherwise I would have seen almost nothing of the game. Errrm, can I get to my seat please? 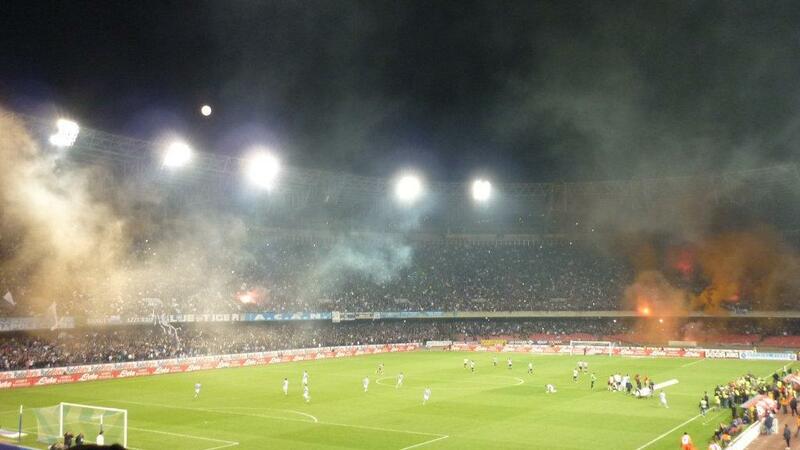 The San Paolo was a cauldron of noise, and the Azzuri players were greeted like semi-gods. This season, SSC Napoli are (or rather were) fighting for the Scudetto. Before this game, they were in second place, 6 points and a game in hand behind despised northerners AC Milan. 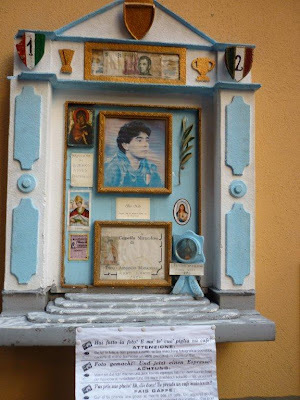 The locals were still dreaming of their first title since 1990 and the magical Maradona days. But Udinese themselves are no mugs. 5th in the table and still with a chance of Champions League qualification, the team from Friuli came to the South without their two best players, Chilean Alexis Sanchez and Napoli born striker Antonio Di Natale and also without a single away fan. OK, it was a far away trip to make on a Sunday night from the Slovenian border to the deep south, but I was expecting a few Bianconeri fans nevertheless. The game started brightly for Napoli, crowd favourite Uruguayan striker Edinson Cavani, nicknamed “El Matador”, getting a few chances but then, the local side quickly faded and Udinese resisted without too many problems. In the stands, it was all happening though, with fans jumping up and down and lighting flares – it was more spectacular than on the pitch. 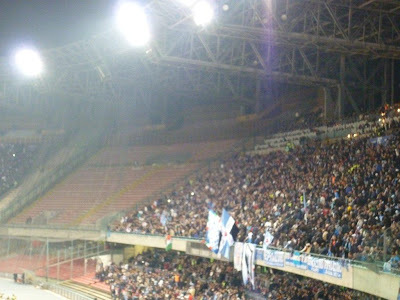 But after 56 minutes, the noisy local crowd was silenced for a while when reported Napoli target Gökhan Inler scored a brilliant goal for the visitors, a shot from far outside the penalty area in the top left corner of Morgan De Sanctis’ goal. Despite the support from their fans, Napoli were unable to find an answer, and 5 minutes later, former Napoli player, Argentinian German Denis scored Udinese’s second, unmarked from Colombian Pablo Armero’s cross. After his assist, Armero kneeled on the ground and made the cross sign, a gesture applauded by many Napoli fans. Then tempers flared. Maggio headed against the bar, Udinese had Domizzi sent-off as the ref awarded a penalty in the 90th, which Samir Handanovic saved from Cavani, of all people missed. There was still time though for Napoli to score through Giuseppe Mascara, but it was too little too late, and their title dream looked well and truly over. 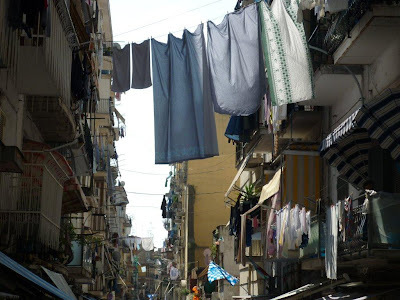 We then left Naples to head South along the Amalfi coast. 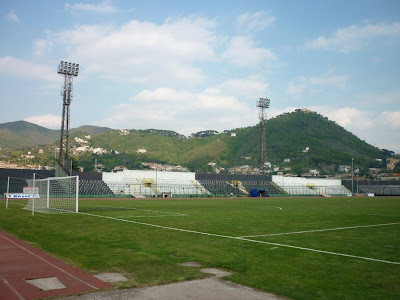 The region is home to no less than 6 teams from Serie C1, so if you plan your trip carefully, you could catch a game of the likes of Salernitana, Sorrento, Juve Stabia (in Castellamare de Stabia), Cavese (Cava de’ Tirreni), Paganese and Nocerina (who have just been promoted to Serie B). 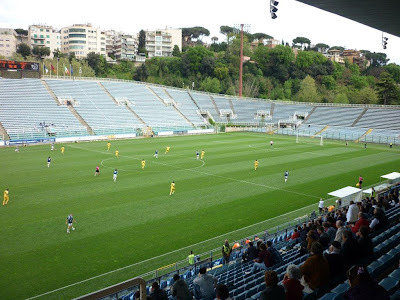 I only got the chance to visit Cavese’s stadum, the Stadio Simonetta Lamberti in the pleasant town of Cava de’ Tirreni. All in all the trip was a quite an experience, a throw back to Italian football of the 80s-90s, in the stands at least. Sweden – the country of cold winters, yellow football shirts, England World Cup opponents, beautiful ladies and expensive beer. Now, pick out the reasons why this fine country makes, for me at least, the perfect location for a European Football Weekend. You’ve all said the beautiful ladies, haven’t you? Now come on, I’m not that obvious. Honestly….I’m not. This was my first trip of the year to Sweden, a country that I visit as often as I can (including every Midsummer – second only behind Christmas in the Swedish celebration list and a time when everyone spends the whole day amongst friends and family drinking far too much alcohol and eating far too much herring) to see friends, spend time with my Godson and to cram in watching football. OK, it helps that some of my friends are beautiful ladies and I get to spend Saturday nights out in their company, but there’s more than that behind my trips. One of those reasons is the greatest club in the land, the club with the greatest football fans in all of Sweden: AIK. The reason I follow AIK, and for that matter Swedish football, can be traced back to the evening of Monday 2 June, 2003 and the Stockholm derby at Råsunda. With the final minutes being played out and AIK three goals adrift of their rivals Djurgården, they mustered the strength to score the three goals needed to equalise the game. I was standing behind the goal amongst the Black Army, AIK’s vociferous and fearsome supporters. With the noise they were making it was to be expected that the Gnaget players on the pitch would never give up. From that moment, jumping around in that Swedish stand whirling my top around above my head with the rest of the delirious fans, I was hooked. My five day Sweden trip was to take me from Stockholm to Gothenburg, coast to coast, with the main event being a Sunday trip for the match between IF Elfsborg and AIK – my first away game after many visits to AIK’s home stadium, Råsunda. With the (expensive) trains booked, we had an early start on the Sunday morning to travel from Örebro to Borås. An early start being more to do with the late night the previous evening. Of course, this wouldn’t be EFW without some kind of beery story-telling, right? So here goes. After too many ales in the fantastic Wirströms Pub (located in Gamla Stan, Stockholm), where I had left sober friends to go to the Djurgården match and returned to find them caned drunk, we had ventured to the edge of Gamla Stan and Slussen to another pub. The pub, that shall remain nameless, was one of those bars where the old ladies go to pick up younger, much drunker, guys. I wasn’t that drunk (or maybe the ladies were too fussy…whatever, I’m sticking with the former). Getting to bed after 3am and being out of my friend’s apartment by 8am meant that I had tiredness and a hangover to fight throughout Saturday. Bravely I ventured on. A Saturday evening out in Örebro was the perfect antidote. True, the town may be a little on the quiet side, but given my numerous visits there it does feel like a second home to me. An early evening Easter Dinner Party (serving ‘herring cheescake’ – sounds awful but it tasted fantastic, as did the rest of the food) before hot-footing it to the pub to meet more friends in time for the El Classico kick-off. I really should be telling you about going clubbing with the very beautiful Ida and Emelie, but I shunned loud music and gorgeous girls in order to talk football with other friends (not that Johan, Niklas and Mats are ugly, they just aren’t female and in their twenties). Anyway, Emelie would have the pleasure of my company at Örebro SK on the Monday night! But yes, I know, it’s a poor excuse and I do feel slightly shamed! So, Borås. Located over towards Gothenburg, it’s a quiet town. We were one of the first of the AIK fans to arrive. We grabbed some food and looked for a pub. And looked for a pub. And then found one…that was full of Guligan (Elfsborg fans). 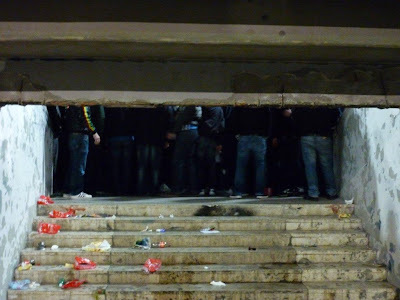 We decided against going in, not because we had AIK tops on and thought that there might be trouble, but because I wasn’t going to travel all this way and not have a beer with a load of Gnaget fans – so off we went looking for a bar that would have the travelling Stockholm fans in. We needn’t have worried – they would soon find us. We followed the noise of fire-crackers and the sight of flares up Allégatan, where we could see some of the supporters’ coaches arriving, beyond the line of Polis (or, in English, Police – though if you’re a Geordie you don’t require the translation). We decided to grab a beer just before the Polis line and grabbed a table in the outside area of Torget. The barman wore an AIK top and the beer was the cheapest I can remember in Sweden for at least four years – what could go wrong? Well, the sight of about fifty staggering youngsters is what could go wrong. Swedish football has a problem within society of certain people attaching themselves to clubs in the same way that English football had in the 80s. This is something I have only read about (including a mass organised fight last year involving fans from all three of the main Stockholm clubs), and one incident at the Stockholm Derby aside, is not something that I’ve observed before. But as pissed Swedes, buoyed by cheap alcohol from the System (the state owned off-license where you buy alcohol), filled the small square the atmosphere quickly turned tense, the air of imminent trouble enveloping and then suffocating. This wasn’t because of all of the fans, merely a small percentage of those present. The Polis carted one fan away, and then when one of his mates ventured down to their van to remonstrate he too was bundled into the back. Arguments flowed as to why the second lad had been allowed to go down, his friends letting him through instead of pointing out what would obviously happen. Arguments continued and then one guy took an absolute pasting – people rushing out of the way as fists flew under a parasol. But then the singing started back up and we headed to Borås Arena for kick-off. Amongst the fans walking up were a few ‘civil’ Polis – polite and also in plain clothes so as to ensure that there was no trouble. An example of their work being that as we stopped at a rail crossing and a lad started banging the barrier, the officer was straight in telling him off. As we approached the away end it became glaringly obvious that the right decision to leave early had been made. Airport style security awaited us. As the queue eventually deposited us at the front, I had to empty my pockets of all contents: coins, notes, phone, voice recorder, camera, cigarettes, lighter, snus, assorted train and bus tickets and handkerchief. Once I had been frisked for the first time I walked through the detector and set it off having forgotten to take my belt off. Another deeper frisk down later and I was loading my pockets back up and heading to the back of the stand with only minutes to spare before the teams came out of the tunnel. I looked back down towards the long queues snaking around behind the stand as those who had left the pub after me were still minutes away from the security. The Elfsborg fans just walked straight up to their turnstile, had their ticket scanned and were inside. As the AIK fans filtered in, flags were dished out like hamburgers at a McDonald’s kids birthday party (or it might be better to use Max instead – the Swedish equivalent and also the reason why this stadium was not used for the Euro Under 21 Championship in 2009; Max refused to close the restaurant at the stadium following an internet poll completed by local residents and so due to the sponsorship deal Ronald has with UEFA, games were moved elsewhere) and before me suddenly resembled a carpet of yellow and black, with the AIK fans again proving why they are the best in Sweden as they sang and waved these flags for the full game. Other notes to make about the fans, and the source of a longer list compiled between me and Johan during the course of the day, were different things you can do at football instead of watching the match. Number one was the Black Army guy who spent all day making sure the fans were OK. This went from telling everyone where they had to go for the bus, clearing up any problems people had, getting people inside the stadium who were too drunk to walk, setting up the t-shirt stall, selling the t-shirts and just about everything else that prevented him from watching the match. Respect, sir. Number two on the ‘things to do at football’ list (and please, feel free to add other examples in the comments box below) was the guy who spent almost the entire match standing behind the away stand arguing with people. Number three belongs to the sleeping beauties – those fans that just had to sit down (or in the case of one, lie down on the terracing) and sleep the booze off. The match was the age old tale of two halves. AIK bossed the opening 45 minutes with Mohammed Bangura scoring twice, the second being a sublime finish from 25 yards out catching the ‘keeper off-guard as there seemed little chance of him getting any kind of shot away, never mind one of such quality that pierced the bottom corner. Elfsborg, through Niklas Hult, got a lucky goal back just on the stroke of half-time. The home side came out for the second half and pushed Gnaget back, the visiting defence creaking under the pressure, and then David Elm scrambled an equaliser in just after the hour mark. The away supporters responded with more songs. The loudest singing to strike up came just after the equaliser with the sight of London’s finest player, Kenny Pavey warming up. Ganget fans talk of the AIK spirit and in Pavey this is firmly represented. AIK highlights of recent times include Pavey going berserk when scoring a vital goal to beat Hammarby in 2009 and then the way he celebrated the winner, scored during the final minutes of the Allsvenskan winner-takes-all game that same year in Gothenburg against IFK. With every away fan singing “There’s only one Kenny Pavey” his first act when getting on the pitch was a crunching tackle to win the ball. If Andreas Alm had introduced him earlier then AIK might have got back on top; if he had have been introduced later then AIK might have found themselves behind. As Elfsborg pushed forward Pavey was a constant outlet on the right and cut-off the home attacking threat down his flank. AIK also had their ‘keeper, Ivan Turina, to thank for keeping them level as he made a number of top class saves. With the final whistle came a quick exit. As the AIK players applauded the brilliant support, we slipped past the line of Polis and coaches that were blocking the away end. Fans were quickly transported away from the stadium in a controlled environment as we walked back into the centre of town to kill time before catching the train back to Örebro. For a while we struggled to find a pub that was open and then when we returned to the train station we found plenty of away fans still in great voice. AIK – I still haven’t seen you win a game during my visits but you are the best in Sweden. Over the last couple of years I have discovered the joys of watching European football across the continent and have simultaneously discovered the joys of EFW. Why not combine the two I thought and share my own experiences in the same way I enjoy reading of the many and varied EFW escapades. This season has witnessed some great trips to places as diverse as Zagreb, Lisbon and Eindhoven. Looking for something different I hit upon the idea of Sweden. Why wouldn’t I? The season had just kicked off, it wouldn’t be snowing and it’s always seemed like such a nice place. After all, I drive a Saab so I have a real affinity with the place already. A bit of t’internet research and a quick response to an e-mail sent to IFK Goteborg led me to pick out the clash of the Swedish titans, IFK and Helsingborgs IF, as the place to start. Can I buy tickets on the day I asked. ‘Sure you can, we would love to welcome you to our beautiful stadium’ came the reply. Being ever wary of pitching up hundreds of miles from home and not being able to get in, I took the easy way out and purchased two main stand tickets through the link on their very easy to follow (thanks to Google translate) website for 220 SKR, about £22 each. Rather handily I was able to download the match tickets and print them off at home. Nice. A ridiculously early start from Lincolnshire saw my erstwhile travelling companion Hutch and I arrive at Stansted at 5.30am and after parking in the long stay car park (which judging by the length of the shuttle bus ride is probably in Hertfordshire) arrived just in time to attempt a take off at 6.45. I say attempt because in over 30 years flying around the world I have never experienced an aborted take-off before. It was a little unnerving to feel the brakes slammed on as we hurtled along the runway. ‘Welcome to Gothenburg’ announced a wag in the cockpit as we came to an abrupt halt. Alas some bright spark on the ground had left the cargo door unlocked. Well what should I expect for a flight costing £40 with free web check in? Luckily no further incidents befell us and we were soon in downtown Gothenburg sampling the sights and the local hostelries. The city is quite compact and a number of bars are situated on the main drag Kungsportsavenyn. We settled for the quaintly named ‘Dubliner’ and settled in for a few jars. If the aborted take-off wasn’t enough to induce heart failure, the price of beer certainly did the trick. Two pints of Spitfire came to 124SKR, about £12.40. Yes that’s right, £6.20 a pint! Significantly lighter in the wallet and the head, we made our way to the main event. The stadium is called Gamla Ullevi and forms part of a bigger complex only 5 minutes walk from the central station. The stadium replaced Gothenburg’s old ground a couple of years back and is a purpose built arena with a 16,000 capacity. A quick jar in the supporters bar underneath the main stand led to some friendly banter with the locals who found it very strange that we had travelled from England to watch a match between two teams neither of us supported. IFK had started the season badly and had lost both opening games. Helsingborgs however had won both of theirs picking up from their runners up placing last season. Already there was talk of this being a six pointer for IFK as defeat would further sap confidence of a young team and leave them in the relegation places. The ground was probably two thirds full with Helsingborgs bringing around 600 fans with them on the 3 hour train journey up the coast, which when combined with the IFK scarf waving ultras making a fair racket made for a feisty atmosphere. The game itself was very open with both sides looking dangerous coming forward but a little shaky at the back. Rasmus Jonsson stood out on the left for Helsingborgs as did Elmar Bjarnason on IFK’s left flank. It was no surprise then when a surging run from Bjarnason saw him square the ball for the delightfully named Andreas Drugge to poke the ball home. Cue mild hysteria. It was at this point that I noticed two flags over in the opposite corner. I’ve no idea who Ragnar is or what presidency he or she is standing for but I wish them all the best. And why Stadler and Waldorf are there too was equally baffling. Strange people these Swedes. Half time came and went with IFK 1-0 up. The only reason the lead had not been doubled was thanks to a quite brilliant reflex save from the Helsingborgs keeper Hansson (Alan to his mates). IFK were on top for the first twenty minutes of the second half with Alan in great form again making two more outstanding saves. You just knew that as they hadn’t scored, the inevitable would happen. Alas, it did and an inswinging corner was nodded home by the rather tall and unfeasibly blond centre half Peter Larsson. Simple. Helsingborgs came into the game and looked far more likely to sneak a winner and it came as no surprise when, as the 90th minute loomed, their centre forward Alexander Gerndt (the only lad on the park whose name didn’t end in ‘son’) rifled home an unstoppable left foot rocket from just outside the box. The Helsingborgs fans behind the goal went as wild as Swedes seem to get and waved their scarves around feverishly in celebration. There's Liverpool vs Everton. Manchester has got City vs United while Milan is Inter vs AC. But who needs all this red and blue city rivalry when you've IJsselmeervogels and Spakenburg? Twice a year the charming little town of Spakenburg (population: 16.000) suffers from a severe case of derby fever when two non-professional teams, the Rooien (Reds, IJsselmeervogels) and Blauwen (Blues, Spakenburg), are about to clash. It is the time of the year that true colours are to be shown. It is said that when you're introduced to your parents in law in Spakenburg, they are more concerned whether you support the right team than the future plans the two of you might have. In Spakenburg, the team you support is also your identity. You're blue or a red in the first place. Surely, there are enough derby's in the Dutch leagues but this one getting more and more popular amongst football fans around the country. All in search of the football authenticity they are becoming more and more deprived of in professional football. The atmosphere, the people...It isn't hard to see why fans from Germany, Belgium or England travel all the way up to Spakenburg. This game has got everything a derby needs with the rivalry of the two stretching far beyond the colours of their kits. First, the backgrounds of the teams. IJsselmeervogels was established by labourers and fishermen whereas Spakenburg (ironically established as Windvogels and later Stormvogels) is the club of farmers and clerks. Secondly, there is a huge difference in success. IJsselmeervogels is by far the most succesfull team beating Spakenburg on league titles (31-6) and over-all championship in the non-league (6-1). And the rivalry is reflected by their accommodation as well. Their stadiums which are situated next to each other are amazing for non-league standards and they take pride in showing off to each other. When Spakenburg built a new stand a few years ago, you could expect IJsselmeervogels to build a bigger one shortly after. During the build-up to the game, you could feel the tension rise in Spakenburg. Everywhere you look there are signs of (half of) the event of the year. Flags and banners hanging from the windows, kids with faces painted in Indian warrior style, and their parents also dressing up for the occasion. People were hosting parties in their back gardens around the town as there was to be no alcohol served at the ground or in the surrounding pubs - until the evening. And surely, the sight of these intimate blue or red gatherings added to the buzz. It is probably what derby fever is all about. And mind you, in its infectious. I noticed I was picking up pace on my way to the Westmaat, excited about what was about to happen. The stadium was packed to the rim with a capacity of approximately 9,000 (that’s over half of the population of Spakenburg!). At least those were the official numbers. Loads of people sneaked in during the match or watched the game from the Spakenburg canteen and even from the banks outside the stadium. After the ‘ultras’ of IJsselmeervogels and Spakenburg did their bit, the game kicked off. The tension was too much for the Spakenburg keeper as he slipped up twice gifting goals to the home side. The game had all the features you could wise for: 22 players determined to give it their best, a cheerful crowd, and handful of goals - while a dozen more chances were wasted, and some doubtful decisions by the ref. After the final whistle, and a 3-2 win for IJsselmeervoges the pitch - as per tradition - was invaded by the home supporters. While they were celebrating, loads of people rushed off to head for the bars in town for some drinking sessions, either to remember or forget which colours they represented. *As a footnote to this report, there were several complaints filed to the local press following this game with regards to the organisation of the derby. It was noted that fans had managed to gain access to the game despite not having match tickets. As it is, hundreds can no longer see the pitch during the match due to overcrowding. Large screens beaming the game live have been erected to partly alleviate the problem, but has the Spakenburg derby got too big for the town to cope with? Every nook and cranny is taken. Has the derby got too big for Spakenburg? Like this? EFW was at the derby last year. Read all about it HERE. I wanted it to be a derby, I wanted it to be a derby so bad it wasn’t funny. I’d been looking forward to this game for months. In fact, as soon as I heard ‘The Students’ got promoted my mind ran with the notion of; University of Queensland – Taringa Rovers derby day. What am I on about? Well, firstly a little foreword and some background. Truer words have never been spoken. The league was plagued by high profile violence between what are known in Australia as ‘ethnic clubs’. Although they were the pioneers of Australian football originating from the late 1800’s through the world wars and of which a lot are still operating today, the prevailing consensus was that they alienated the Anglo-Saxon, Anglo-Irish majority population through retaining strong links to their cultural heritage. Flick through a telephone and business directory in Australia and you will see examples of this; Football Club. A la; Preston Lions formerly Preston Macedonia, Sydney United formerly Sydney Croatia, Bonnyrigg White Eagles etc. Skip forward to 2005, the NSL was made defunct and old clubs dropped in favour of the new A-League which left a considerable amount of bad blood between the old ‘NSL-supporters’ who’s clubs had driven the development of football in Australia, supplied players to the national team, played in top flight football since their early days and were now (and still are) residing in state league’s being told they are too ‘ethnic’ to compete in a national competition pitted against a new, some-what flawed, arguably soulless, plastic competition trying to undo social and racial stereotypes prevalent with the majority of Anglo-Australians. Brisbane has luckily kept its nose clean of most of this recently. There isn’t likely to be a riot anytime soon put it that way. The resulting state of play at the moment is that the country is made up a national competition and the rest are independent leagues making the football pyramid looking more like the football ‘chewing gum mashed under the park bench’ shape. The whole reason I explained that brief history of domestic Australian football was due to the fact that this match is in Football Brisbane’s flagship, the Brisbane Premier League (BPL). And a lot of the teams in these leagues are from grass-roots ethnic origins and to explain the large gap and disdain some clubs hold for what is now the elite level of play in Australia. I’m relatively new to this whole Football Brisbane business and simply selected my allegiance to the University of Queensland due to me being alumni and the home ground’s extreme proximity to my house. I had casually followed scores online last season and I’m quite enjoying the time I’ve been having whilst the national comp is on its off-season; my main reason for sourcing local football. I was joyed when UQ was promoted to the BPL from Division 1 and previously attended 2 home matches for The Students this year, one, at the UQFC’s traditional home; ‘Oval 3’ on the UQ campus which is little more than a field and a tiny building housing the canteen, a 1-0 win for The Students over Capalaba. The second, last weekend at their new ground (devastated by the Queensland floods a few months prior), 2 minutes walk away through the campus at ‘Oval 5’ that is usually a rugby pitch with an athletics track around the outside. It’s relatively new and features a large permanent grandstand giving it a certain ‘stadium’ quality that is undoubtedly the most impressive in the league. 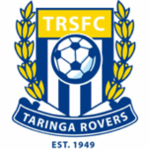 Taringa’s fortunes however have been mixed this season. Having been in the Brisbane’s top league since its promotion in 1983. They have failed to score major points getting only 1 win and 1 draw from 6 matches including an 11-1 home drubbing from Wolves FC. At this point I should say this isn’t a match report or a tale of a memorable football weekend, it should be more like the definitive guide of how-not-to-do-an-EFW. Firstly as you may of noticed, this match isn’t in Europe, secondly the weekend didn’t really play out to plan. In fact the only thing E, F and W about this was 90 minutes of the F. Saturday came around; the day of the game and the hours leading up my friends ditched me quicker than English fans supporting the team at a world cup. For one various reason or another they left me high and dry to the point that even my girlfriend felt sorry for me and offered to go. Her proposal was considered and rejected out of kindness from myself mainly due to her dislike of what she terms ‘random football’; consisting of a match between two teams she doesn’t care for. Disappointed but still buoyed by the potential of a good match and defiance to go despite the progression of things I trotted off to Taringa. The journey to the ground was long and arduous; the 3 minute car trip was punctuated by brief periods of excitement about my first BPL away game intermixed with periods of frustration being stuck behind a Volvo doing 10 under the speed limit. Arriving at the ground I was impressed by the setup of the field. Along the sidelines there was a small, read tiny, stand flanked by a canteen and a BBQ running. The other sides of the ground were bare with sponsorship boards attached to what appeared to be temporary construction site fencing, made permanent. After quickly enquiring where the bar was I headed off towards the large double story clubhouse complete with terrace/veranda/balcony on the second floor. Up the stairs and into a large social area with pool tables I ordered myself a lager, all bottled and none on tap unfortunately. Never the less it was relatively cheap and I went to said balcony to grab a seat and watch the game. The other end of the balcony was packed with Rovers supporters and before kick off my end of the balcony was filled with UQ supporters and reserve players enjoying a drink. The atmosphere was jovial and everyone was looking forward to what was sure to be a good game. There were some brief chants from the Taringa supporters before the game got underway which managed to get the rest of the crowd in the mood to see this apparent local derby. Post kick off it didn’t take long before the first goal; a mash of boots in the box caused the ball to flick out to Paul Sludden who graciously flicked it up-and-over the keeper into the back of the net. The bumper crowd of approximately 75 went into raptures. It didn’t take long for UQ to equalise courtesy of a Ryan Solter sizzler from the edge of the 30 yard box. This is the point in the tale where the competition and spirits of the UQ supporters fade away. Before the half time break Taringa was able to score another 3 taking the tally to 4-1 including a master class 2-on-1 play where the ball was taken to the left goal post and passed back to the centre of the 9 yard box where it was slotted through with ease. UQ’s defence had a tough time accounting for the prolific Rovers squad. It was hard to tell whether or not Taringa easily slipped through UQ’s defence or if UQ simply did not mark their players, perhaps a bit of both? At the end of the second and final term Taringa capped off their win with a further 2 goals bringing the total up to 6 vs. 1. The game was finished and whilst the majority of supporters left happy, however, I did not. The students were belted and with the looming Easter break the rest of the season could be a struggle. Only time will tell for this hot and cold, on and off again side. One thing is for sure; Taringa deserved the win, and are now reaping the benefits with what appears to be a very strong season ahead after that 11-1 debacle. Of interest to some those whom read Football Nomad, I met founder Andrew Weber’s brother after recognising him from a video. And that’s my story of my EFW. In the end when you have 11 guys in each side playing their guts out and to the best of their ability it doesn’t matter if you’re watching Real v Barca or Taringa v UQ, as long as you’re having fun. Local football is the life blood of the game and if your A-league, La Liga, EPL, MLS, Ligue 1 so on and so forth is taking some time off, why not head down to your local club and see how grassroots football is played and run. Of course, you will probably need better friends than mine! Unfortunately for my family, I’m addicted to sport. If the chance arises to go to a sporting fixture of pretty much any type, I’ll be there. Spare speedway tickets? Go on then. Your friend can’t make it to the ice hockey with you at the weekend? Sure thing, count me in. A day at the darts? Yes please. You get the picture. With this in mind, it was with some excitement that I took delivery of two tickets to Sunday’s FA Cup Semi Final between Bolton Wanderers and Stoke City, courtesy of a competition run by the excellent website Back Page Football. I’m a nightmare at Watford matches. I want them to win every game. Desperately. Let’s just say that when I’m engaged in watching Watford, I can get a little…intense. It was therefore nice to be able to look forward to a game of football that meant nothing to me, but meant the world to the other 80,000 odd people in attendance (The Club Wembley family the notable exceptions!). I was looking forward to watching the game with a bit of detached impartiality. I was looking forward to being able to soak up the pattern of play without worrying about how long was left and who was going to win. I was looking forward to sampling the atmosphere without feeling the need to help generate it. We were to be Bolton Wanderers fans for the day. Firstly, the (excellent) tickets were in the Bolton section, and secondly, the legendary and slightly unhinged ex-Hornet Paul Robinson would be starting at left back for the Trotters. Despite having nailed our proverbial colours to the mast, it quickly became very apparent that we were at someone else’s party. As we waded through the discarded beer cans en route to the ground, the excitement was palpable. ‘Lucky sods’ Andy muttered as we passed group after group of bouncing, chanting fans. ‘I wish we were here with Watford’. Inside the ground, Wembley looked magnificent in the April sun. Whatever the rights and wrongs are of playing Semi finals at Wembley, as the 4pm kick off approached I can guarantee that every person in that stadium was glad to be there and excited to be a part of it. Whilst Bolton had failed to sell their allocation (instantly banishing any lingering doubts that I was denying a Bolton fan a ticket), there wasn’t a seat to be found in the Stoke end of the ground and by crikey they didn’t half make a din. I’m sure I’m not alone in having mixed feelings towards Stoke fans, but give them their due, they generated an extraordinary atmosphere. The teams strode out and in a bid to feel part of it, my brother and I struck up a chant of ‘Robbo! Robbo!’ I waved at him too. He didn’t wave back. ‘Good lad’ I thought; ‘he’s focussed’. The game got underway and there was no denying it, I was excited. FA Cup Semi Finals are big games in their own right, but even more so when the two participants are so infrequently involved in games of such magnitude. This was definitely going to be good. And of course, if you support Stoke City, it was good. It was better than good. It was extraordinary. After half an hour the game was well and truly over, in truth, it was probably done and dusted after 17 minutes when Robert Huth was the unlikely man behind a 20 yard strike into the bottom right hand corner. As Stoke shot after Stoke shot resulted in Stoke goal after Stoke goal, the day took on a surreal feeling. As the red and white end of the ground partied, things quickly unravelled around us in amongst the Wanderers fans. Fights broke out amongst fellow supporters, the initial excitement quickly punctured by the reality that was unfolding in front of them – clearly too much to take for a small minority. Some fans had seen enough after half an hour and began their long journey home early. Others hurled abuse at their hapless team. The majority sat in stunned, disbelieving silence. All the while Andy and I were trying to convince each other there was a way back for our adopted side. ‘If they can nick one before half time, they’ll be back in it’ we suggested. We were desperate for the tight, competitive game we had forecast to come to fruition. Having seen these sorts of games before though, we both knew that there was only ever going to be one winner. If I’m honest, disappointment was the only emotion I could muster. I wanted to feel sorry for the Bolton fans, and to a degree I did, but really I just felt sorry for myself. The game we’d seen wasn’t the one that we’d expected – I felt like hitting rewind and start the game again. Once more from the top Bolton, this time with feeling… I’ll come clean to experiencing a flicker of sympathy when the disconsolate fan next to me broke his 2nd half silence. Two words were all he could muster. ‘I’m ashamed’. It was an interesting experience and if offered the same ticket tomorrow, I’d take it again, but it brought something into sharp focus for me. A realisation that has provided me with some empathy for those around me who struggle to understand my lifelong obsession with watching Watford home and away. Neutrals want to be entertained. Supporters just want to win. The mood on the packed trains away from Wembley mirrored that of inside the stadium. Stoke fans jubilant, Bolton supporters tired, drained and numb. It was on the train that I finally made some sort of personal connection with the days events. A few seats in front of me sat a Stoke fan. He was alone, and in his sixties. He said nothing, contendedly staring out of the window, no doubt gleefully recounting each of Stoke’s five goals. Then his phone rang. He took the call and listened. It was obviously a friend or family member calling to offer their congratulations and as he recounted his version of events, there was a quiver in his voice. He was so excited, so proud, so happy about what he had just seen that he was close to tears. The hairs on the back of my neck stood up as I recognised the feelings he was experiencing. The feelings that only sport can provide. The feelings that only those with an emotional and physical investment in their team will ever enjoy. The feelings of a true football fan. This man was happy and that was all it took. I was happy too.